Rely on a consistent, single-tool environment for electronic control unit (ECU) development with AUTOSAR. EB tresos Studio lets you configure, validate, and generate your ECU basic software (BSW). 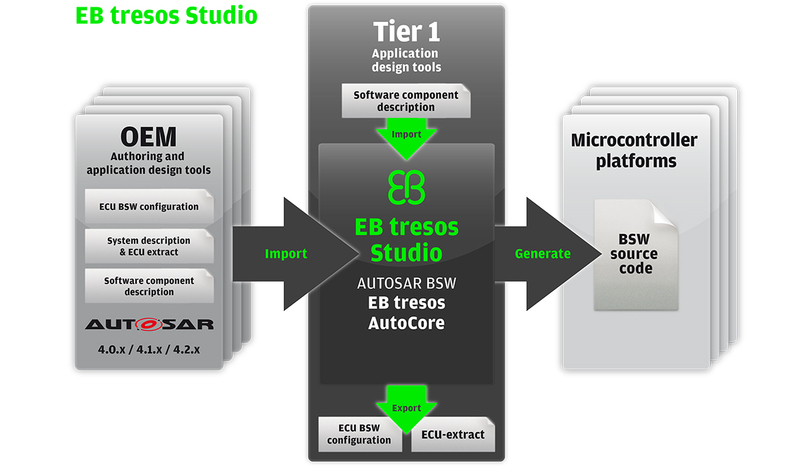 EB tresos Studio is the tool environment for our EB tresos AutoCore and EB tresos OsekCore. With its importer and generator interfaces, the tool fits perfectly into the AUTOSAR workflow and can be seamlessly integrated into existing tool-chains. This allows the integration of company-specific basic software modules and legacy software components. The EB tresos tool environment offers full support for AUTOSAR 4.x releases. It’s also the right configuration tool for EB’s OSEK/VDX-compliant basic software. EB tresos Studio is based on Eclipse, which makes it extendable with new user functions. Also, it allows development of carmaker- and Tier 1-owned modules. Users benefit from one tool environment for configuration, validation, and code generation instead of juggling multiple tools. Multithreading mechanisms are used to save time for code generation. Various assistant functions and wizards ease day-to-day work. We guarantee interoperability with industry-leading authoring tools and application design tools, e.g.- dSPACE System Desk/Target Link. Also, EB tresos Studio is the industry-standard tool for Microcontroller Abstraction Layer (MCAL) development by semiconductor suppliers like NXP, STM, and Infineon. To simplify the configuration of an ECU, EB tresos Studio provides several importers such as the System Description Importer, the DBC Importer, the Fibex Importer, and the LDF Importer. The importers configure the BSW automatically. The Generic Configuration Editor is the graphical user interface through which developers may edit configurations for basic software modules that comply with the AUTOSAR standard. Also, third-party software like MCAL modules or carmaker-specific modules can be easily integrated and configured with EB tresos Studio. EB tresos Studio also provides features for sophisticated configuration validity checks and navigation between configuration parameters. EB tresos Studio provides powerful ways to validate configuration data. A background verification service assures quick feedback while keeping the main graphical user interface responsive. Code generators are provided for efficient code generation. EB tresos Studio comes with several code generator languages (proprietary, Jet, Java) that are suited to different use cases. 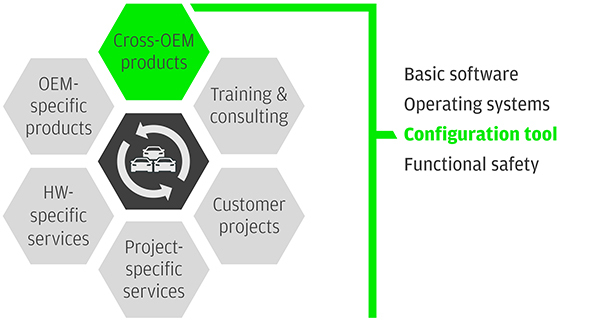 In addition to these code generators, the product supports seamless integration of third-party code generators, such as code generators shipped with MCAL modules or carmaker-specific modules. EB tresos Studio provides step-by-step instructions using a guided workflow. The instructions guide the user through the configuration of the basic software. A workflow consists of a list of steps the ECU developer has to perform in order to accomplish a certain task, e.g., to set up a configuration project or to run an importer. EB tresos Studio also handles project-specific workflows, which are only shown in the context of a certain project.